If music be the food of love, what does that make silence? The abortion of love? Also, what would music taste like? Chicken? Haddock? A nice portion of salad with a side order of Couscous? Oh! Wait a minute! Maybe these people would know! Director: Liam Lynch; and Actors: Jack Black, Kyle Gass, Ben Stiller, Tim Robbins, and John C. Reilly. Especially in 2006 and for 94 minutes. JB (Jack Black) just loves his rock and roll music. Heck, he loves it so much, that he actually tells his Dad (Meat Loaf) to f*ck off, and then goes in search for fame and fortune in Hollywood. However, once JB gets to Hollywood, he befriends a fellow musician called KG (Kyle Gass), who helps him hone his craft. Well, when I say 'help', what I mean to say is that this round-faced fool shuns him, dupes him, gets him to clean his apartment, teaches him the art of Rock and Roll, before coming clean and unveiling to JB that he's a mama’s boy. Which is nice of him, isn't it? Still, that piece of news does not deter JB one little bit. Instead, it goads him to form a band with KG -- called 'Tenacious D' -- as they then go to a nightclub together, to perform rock and roll music and win a lot of cash. But they don't win. Afraid not. Inadvertently they are forced to write a better song to perform to the public, and in so doing, discover two very strange facts not so long thereafter. Firstly, that all the legendary rock and roll guitarists use the same type of Guitar pick. And secondly, they are told by a sales clerk (Ben Stiller), that all these picks are one and the same thing -- the pick of destiny -- as it is an ancient fragment of Satan himself, currently under guard at the Rock and Roll museum. So what do JB and KG do about this revelation? Correct. Go to the museum. Yet again. that's most probably why what next transpires begins when two friends part ways. As strangers attack - a pal get's your back - devils sing - and JB and KG finally get the ding-a-ling-a-ling. 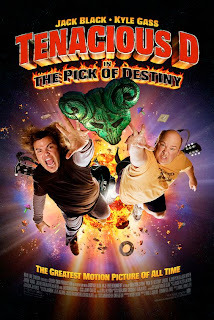 I like to think that ‘Tenacious D and the Pick of Destiny’ is a labour of love for Jack Black and Kyle Gass. Well – lets face it – it’s a story about how two stoners find each other and try to make it in the field of rock and roll. Also, on top of that, this film feels as if it was a dream that one of them might have had one night, only if they ate a sh*t load of cheese before hand though. OK, I know that this remark sounds like a strange thing to say, but aesthetically this movie has a very meandering structure and tone to it. It’s a musical – it’s a comedy – it’s a adventure story – and it’s a skit film too. Moreover, the styles of this film is rather contrasting as well. It’s one third grungy – one third cartoony – one sixth childlike – and the rest is non descript. Granted, the makers of this film have tried very hard to blend all of this together and try to make some sort of unified whole. However, at times, this does not really work in the scheme of thing – even if it is divided into chapters – because the complete package does appear quite uneven in places. Thankfully, to counterbalance this mishmash of tones and styles, the acting always seems very consistent. Jack Black is his ever loveable self – overeager and energetic. Kyle Gass is some sort of animated Pudsey bear – with his facial expressions and movements bordering on the cute and childlike. In addition to this, the cameos are a blast too – especially Ben Stiller and Tim Robbins – as they are all very bold indeed. My personal favourite section in this film is the scene in which Jack and Kyle sing against the devil. OK, I know that it is a pretty hooey scene all in all, but that does not mean that it was not lyrical, funny, enjoyable to watch, and was kind of surprising also. Though to juxtapose this statement, my least favourite section of this film, is the scene in which Jack and Kyle part ways in the dinner. It was too formulaic – sloppy in its construction – and did not really mean anything were the overall plot was concerned. Overall, ‘Tenacious D and the Pick of Destiny’ is a film that any fan of Jack Black, Rock and Roll, or bold comedy would love. Heck, if you like such films as ‘The School of Rock’ – ‘The Blues Brothers’ – or ‘The Little Shop of Horrors’, then you would want to take this film, roll it up into a splif, and then smoke it for all eternity. That’s rock and roll baby – kind of like this film.